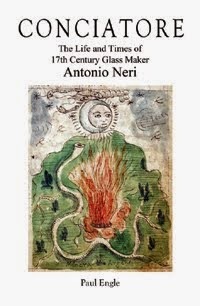 "Under the cover of Antonio Neri's glassmaking book, L'Arte Vetraria, lays an alchemist's treasure. Centuries-old pages invite us to share in his secrets and plumb the glassmaker's art. Unfamiliar methods and ingredients discussed in his book at first may puzzle the modern reader, but soon the pieces fall into place. A careful ear will hear echoes of ancient technique, whispers that speak to the very essence of craftsmanship. A clear eye will see the hands of a master artisan manipulating raw ingredients into new materials. To read his most famous treatise is to join Antonio Neri's odyssey with nature and walk his path of discovery. Through his work, he offers a clear window into not only the world of Renaissance glassmaking but also into the upper echelons of society and into the deepest mysteries of alchemy. We can even catch a glimpse into the birth of modern science. A look into his personal life reveals a man who was born into the comfortable home of a royal physician. His family's circle included famous lawyers, wealthy merchants, archbishops, Vatican officials and perhaps a future saint. In his alchemical pursuits, Neri did not lead a solitary life; he sought out collaborations with others. He made friends among his technical coworkers, but also with princes and powerful international bankers. He cultivated recipes of herbal remedies and worked to cure disease among the infirmed. He came to serve a royal prince in a premier laboratory of its time, yet he worried about the social implications of his specialized knowledge. In the pages of his book, Neri, an ordained Catholic priest, invites us into the secretive world of Renaissance glass formulation. He shows us cristallo, the coveted Venetian glass famously crafted by artisans in the style called façon de Venise. This fabled creation, invented and perfected on the island of Murano, was the toast of European royalty for its finery, a tool of experimenters for its utility and the marvel of commoners for practical items like spectacles. For the first time in print anywhere, Neri revealed to the world the materials and recipes for cristallo and many other rare glasses. He detailed the secrets of color in glass from the delicate blush of peach blossom lattimo to the intense saturation of cobalt blue. Like a fine artist, Neri conducted his craft with a deep regard for process. He tried variations and permutations of recipes that would result in the final product he was after. He took risks with expensive ingredients and he applied his experience to new areas. He helped to shine a spotlight on Tuscan glass and bring it to the attention of greater Europe. He devoted his mind to the creation of dazzling colors and his hands to the perfection of refined ingredients. Just as a great painter relies on the quality of pigments at hand, so must a master glass artisan depend upon the materials of the melt. For the glassblowers and furnace workers who shaped hot glass, a superior batch was crucial to superior results. A great piece of glasswork owes its form to the talent of the artist, but its substance is the province of the craftsmen who make the glass. This pairing put artistry at both sides of the furnace and made virtuoso glass world-renowned. In the early 1600s, Antonio Neri specialized in the glassmaking end of that partnership in Florence at the celebrated Medici court. This alchemist priest supplied a prince's royal artisans with the finest glass that money could buy. The quality of his work showed through the consistency and texture of his melts and through the clarity and brilliance of his colors. As his work spoke to the state of Florentine glass technology, it spoke as well to the state of artisanal craft (fig.1). In Neri's hands, a technical recipe is akin to a composition of poetry. Each ingredient is cleaned, weighed and combined. Conditions are set, containers sealed, the fire lit and a secret of nature is revealed. Neri found his métier not in the creation of finished pieces, nor in the construction of furnaces or the forging of tools. Rather, his passion lay in the concoction of formulas, the roasting and purification of chemicals. He challenged Nature at her own game of creation. The recipes he perfected offer a chance to explore the work of a master Renaissance artisan at a time when art and science were indistinguishable. They illustrate craft practiced with all five senses. For examples, see Page, Doménech 2004. Your book has been on my wish list for some time. Early Modern history and the Renaissance is close to my heart- notably the book hunters, hermeticism and alchemy, and my thesis that Alberti and Raphael merit consideration as the preeminent players in this fascinating period. Conciatore opened my mind in a different direction. Great story, great blog. The post on vitrum flexile is my favorite. My friends at the local glass shop were blown away by that one. Thank you for this. I look forward to every item. Congratulations! 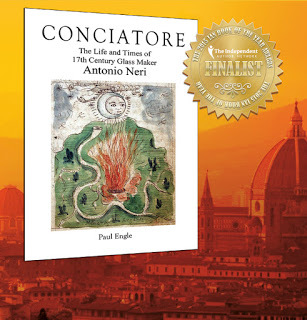 You have been selected to receive a complementary copy of “Conciatore, The Life and Times of 17th Century Glass Maker Antonio Neri”, by Paul Engle. Please supply a shipping address via either Direct message or the email address paul@conciatore.org . This address will not be used for any purpose other than the shipment of your book. Thank you for participating! I’ve just finished Newman’s book about Starkey “Gehennical fire”. The development from Galen’s theory to mineralogy. And would be interesting to read about a priest handling metaphysics and physics of glass making and art in their time.